When you require performing changes in the condition of a Policy, changes in the execution of a Policy or adding vocabularies, it is necessary to create a new version. This version can be created in the Process module or in Business Rules module. 1. 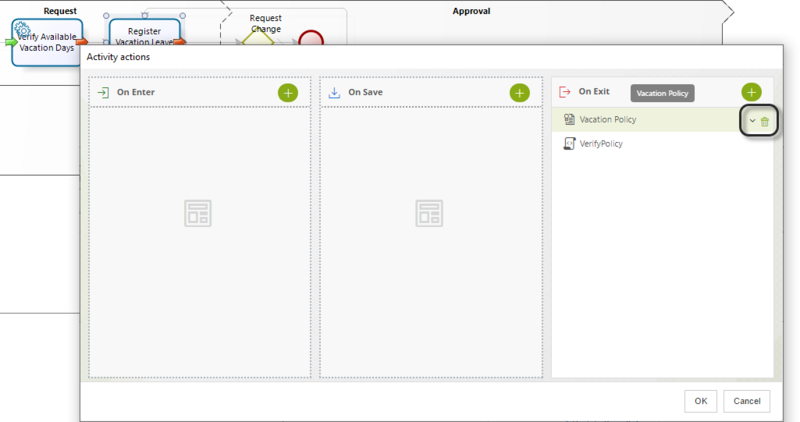 In the Modules view go to the Processes module. If the Policy is global, go to the Business Rules module. 2. Select the process where the Policy is located. If the Policy belongs to an Application search for it. Select Policies. 3. Locate the Policy and Right-click on it. Select Create New version. 2. 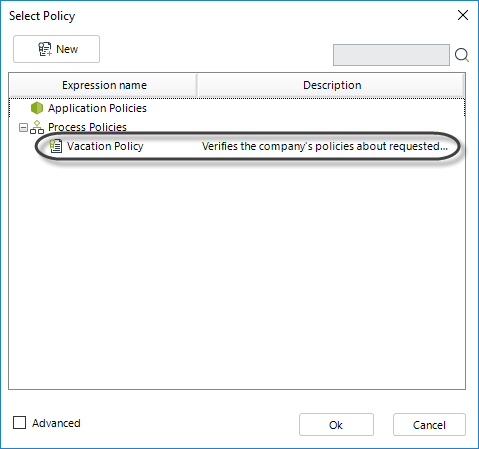 A confirmation window will display to confirm that are sure to create a new version of your policy. Click Yes to continue. 3. 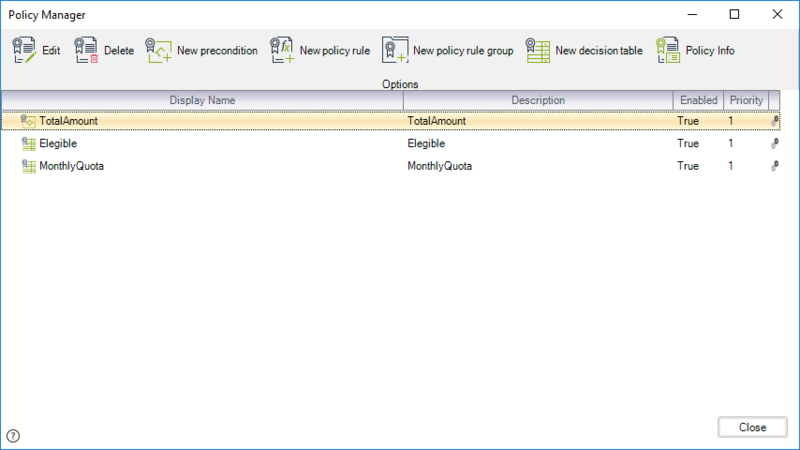 A new window will display the Policy Manager where you will be able to create, edit or delete Policies. The Policies associated with the previous version will be duplicated in this window. 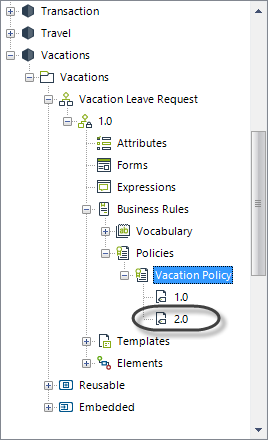 If you want to change anything within your Policy click the component you want to adjust. The Policy Manager will display. For more information about the available options in this window, refer to Creating a Policy. 4. When you are finished with your changes, click on Close in order to save the new version. Once the new version information has been created, you will see the new version created and its historical under the policy. 5. 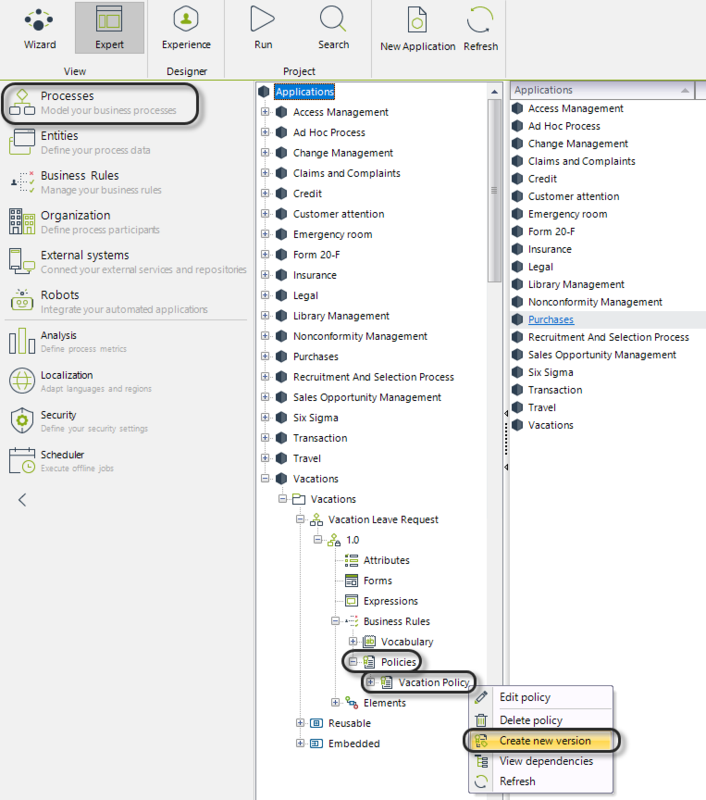 Click the shape where the policy is associated and select the event where the policy is executed (On Enter, On Save or On Exit). Select the policy and click on Delete button. 6. In the same event, Select the Policy item. The existing policies will be displayed. 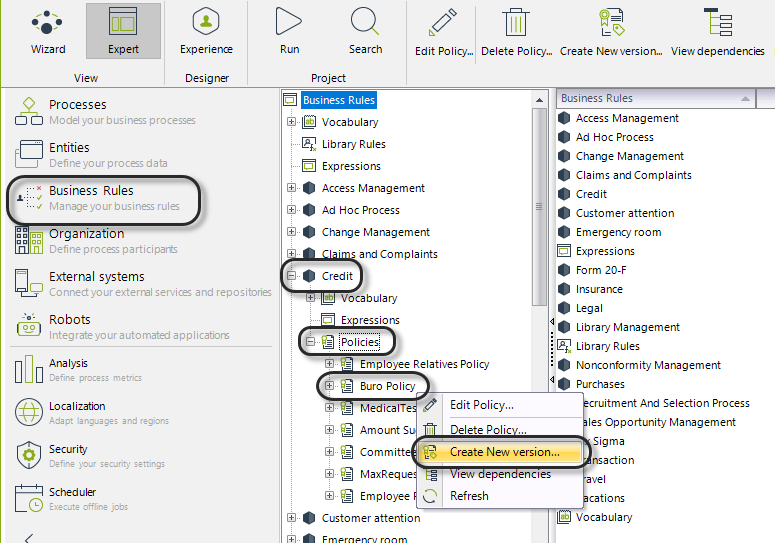 Select the policy which you created the new version and click OK.
•You can replace the new version of the policy as explained above, where it is already being used. Ongoing cases in Production will use the new version of the policy. Make sure the update does not affect the logic of the process. •You can create a new version of the process and relate the new version of the policy if the change in the Policy can damage ongoing cases. •You can to use it in totally new activities of a totally different process.